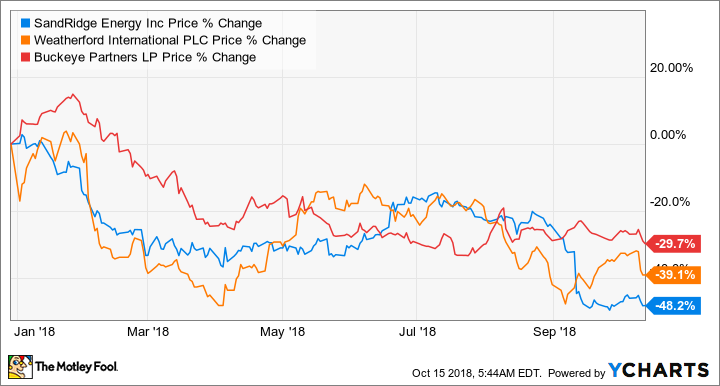 The rising tide of oil prices should lift all boats in the industry, but that hasn't been true for shares of SandRidge Energy, Weatherford International, and Buckeye Partners. As the price of oil has steadily risen for the past couple of years, the thinking goes that it should lift the prospects of all oil and gas stocks along with it. That hasn't been the case for everyone, though, as some companies haven't been in good position to benefit from higher prices and increasing service activity across the industry. Whether the reason is too much debt, an inability to generate enough cash, or ineffective management, there are simply some stocks in this business that long-term investors should avoid. Reading through SandRidge's investor presentations, it wants to give the impression that it isn't the same company that went into Chapter 11 bankruptcy back in 2016. It says all the right things about lowering costs, getting better-than-expected results from its wells, and a plan to create long-term shareholder value. Unfortunately, this shareholder siren song doesn't really harmonize with its earnings results and some of the actions management tried to take recently. When the company emerged from bankruptcy completely debt free, the presented plan was to go away from its days of being a serial acquirer of prospective properties and focus on efficient drilling operations in its existing holdings. Instead, though, management immediately made an offer to buy Bonanza Creek Energy. The deal was met with immediate blowback from several of its largest shareholders as one of the things that got it in trouble in the first place. To make matters worse, the company's current operations aren't exactly setting the world on fire. SandRidge has failed to turn a profit despite higher oil and gas prices; it's burning through its cash pile alarmingly fast, and will likely need some external funding to support just its current operations. Shares might look incredibly cheap, but management is already contemplating questionable moves, and current operations are still deep in the loss column at today's prices. There are plenty of profitable, well-positioned producers in the shale patch to choose from today to not have to take on the excessive risk at SandRidge. I can't remember the last time Weatherford International wasn't in the midst of a corporate restructuring, some sort of "portfolio optimization" program, or whatever other fancy management term that can be used to describe turning around a foundering business. For the better part of this decade, the company has consistently struggled under the weight of its large debt load and the fact that its ability to generate cash from operations has been woefully weak. This is even after selling off several business lines and other assets to improve profitability and chip away at its debt load. The current iteration of a turnaround plan under CEO Mark McCollum is about one year old. Even though McCollum told investors to be patient at the start, there are hardly any tangible results from this plan thus far in its earnings results. According to its most recent earnings presentation, there is a line of sight to reducing costs by $1 billion and to become cash flow breakeven for 2018. This isn't the first time that Weatherford has promised significant cost cuts and to improve cash generation, though. So until it actually happens, it's better to be skeptical. Weatherford is the world's fourth-largest oil services company, with a large footprint in places that will likely start to see an uptick in drilling activity now that international oil benchmark prices are above $80 a barrel. That said, Weatherford isn't the only one fighting for those contracts, and its value proposition compared with other big players like Halliburton and Schlumberger just doesn't seem worth the concerns about executing a turnaround and cleaning up the balance sheet. For years, Buckeye Partners could be counted on as a pipeline company that would provide a high yield and slow and steady payout growth. It was able to do so thanks in part to an incredibly reliable stream of cash coming in the door each quarter, an investment-grade credit rating, and a modest hopper of projects to grow the business. Over the past year or so, though, management has made some ill-advised moves that have taken its reputation and thrown it out the window. As of the company's most recent earnings report, Buckeye had a distribution coverage ratio of only 0.87. This means that cash coming in the door that it could use to pay investors only covered 87% of its total payout. To make up the difference, it has had to rely on debt. Unfortunately, issuing debt to cover cash shortfalls and grow this business is at the limit. The company's investment-grade credit rating is already at risk because of current debt levels, and its current queue of growth projects might not be enough to grow cash sufficiently to meet its current payout. On its most recent conference call, management pretty much telegraphed that it will likely cut its payout as it looks to fund more of its growth with cash from operations. Unless there is some previously undisclosed source of cash, it will have to cut its payout on top of plans to sell assets. What's even more unsettling is that management had been saying for months that its payout was secure and that it could work through these issues. So either management wasn't completely truthful with investors, or it was unaware of the risk. Either way, a payout cut is probably inevitable, and it's going to be harder to trust that management is making the right decisions anymore.